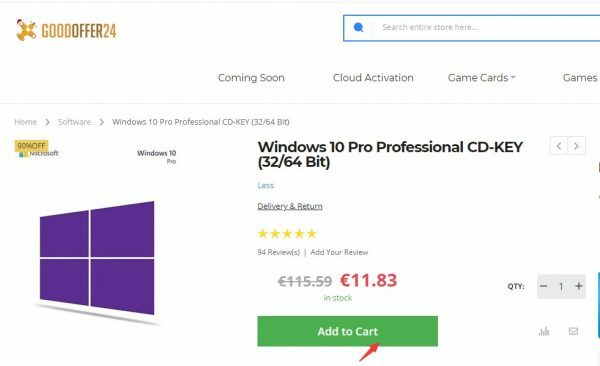 Get Windows 10 Pro at 9,46 € , Microsoft Office 2016 Pro at 21,43 € from Goodoffer24!! Windows 10 brings a lot of great features to the PC.It is the latest operating system combines the strengths of Windows 8 and the popular Windows 7 skillfully.You can spend thousands of dollars on components when building a PC, but it isn’t going to boot without an operating system. Though Linux is a viable option, most people still want Windows because it runs all of their favorite software, including all the latest games. Getting hold of the Windows installer is as easy as follow the instruction here. Whether you’ve paid for it or not, Microsoft allows anyone to download a media creation tool for free. Once that’s done, you can boot from your installation media and install. During the installation process, Microsoft will ask you to for an activation key. You can skip it at this stage and enter it once Windows 10 is installed. But eventually, Windows is going to start letting you know that your install isn’t activated. You need to purchase the activation key to activated your system. There are many ways to get a Windows 10 product key, and they range in price from totally free to $199 (£220, $340 AU) depending on which flavor of Windows 10 you’re after. You can of course buy a key from Microsoft online, but there are other websites selling Windows 10 keys for less such as goodoffer24. Goodoffer24.com, is the new marketplace selling Software keys, Video Games and Game cards at the lowest price and they have brought the best shopping experience to millions of customers online for over ten years. At goodoffer24, you can find the hottest software products with the most competitive price around the world and all online products can be purchased either on mobiles and PCs. The software promotion from Goodoffer24? Extra 20% off discount on all software products : JGO24NY20. In the shopping cart, simply click on „Apply coupon code“ and enter the discount code JGO24NY20 there. 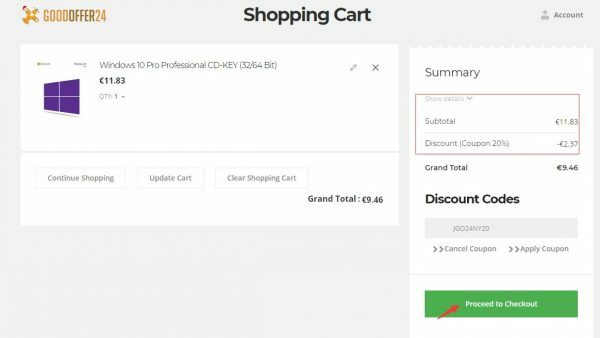 If you then click Apply Discount, the discount will be deducted from the order value. Simply enter the discount code in the shopping cart to save even more! Buy more, save more…. If you click on the „Proceed To Checkout“ button, you only have to select the desired payment method (better to choose PayPal as the payment), enter your data and confirm your order. After the payment, you will then receive the ordered product within a very short time by e-mail – fast and uncomplicated! At Goodoffer24.com you can expect the best service. Shortly after ordering, you will receive the goods quite simply and quickly by e-mail. Please do not forget to check your spam email inbox or Promotion email inbox if you can be sure your orders are paid successfully.You also can choose Paypal as the prior Payment method. So you do not have to wait for days for the messenger. And if it comes to problems or you just have a question, the customer service is there to help you with words and deeds. You can send an email to the address: info@goodoffer24.com regarding to any kind of problem you met. MS Software Neujahr 2019 Aktion: Windows 10 Pro für nur 9,46€, Office 2016 für nur 21,43€ uvm.